Does your organization need assistance in designing or restructuring a library, museum, archive space, gallery or research area? Storage facilities for valuables like art, artifacts, documents, and books must be designed not only with the type of space in mind, but also to accommodate the preservation of delicate materials. We specialized in the design and implementation of cantilever shelving and unique storage solutions designed to protect documents and other high-value items from destruction and wear. We have solutions for all kinds of libraries and storage needs and can design them to ensure maximum visibility and accessibility to staff and patrons. Everything we offer our library and archives clients meets American Library Association standards for strength and durability. Our 16-gauge steel frames are specially designed to hold the weight of books without worrying about sway. The same materials can be used for various storage and display purposes, including maps, costumes, and artifacts. Media storage of all types can be accommodated. Our experienced team of equipment specialists will assist you with bookrack planning and shelving design that meets your unique needs and suits your space. We’ll work with you to design floor plans, understand engineering data, and assess product information. Our systems are a fraction of the price of traditional filing cabinets but offer three times the storage space. There are plenty of mobile solutions on our roster, including incorporating existing shelving with carts. No matter what you are looking for, we’ll work together to find the perfect solution for your needs and budget. 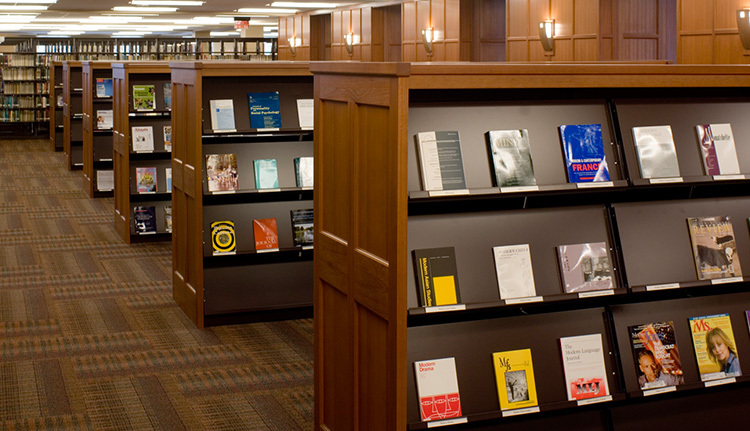 The best way to take advantage of space in your library is with cantilever shelving solutions. Our units are built with triple bends to eliminate the possibility of sagging. Base brackets make up part of the frame, and each frame can handle either a single or double facing setup. Cantilever shelving is specific to the storage needs of most libraries. This type of shelving can adjust to accommodate a range of items and can also be expanded as your book collections grow. Our cantilever shelving is top quality, and we can design it for stationary purposes or install a mobile version. It is heavy duty and anti-tip to offer extra safety and peace of mind. Our shelves are also flexible and easy to disassemble and reassemble, so if your library is facing the strain of relocation, this is one less thing you’ll have to worry about. You can also customize the shelving levels, heights, and colors to meet your design needs. Mobile shelving is a must for any library environment and can be built into any existing environment. Most importantly, they offer your clients and staff maximum access to precious artifacts while keeping them safe and still, reducing the risk of damage. Mobile shelving units come in a variety of forms, from carts to automated retrieval shelves. Moreover, we can build interchangeable systems combining various shelf types to accommodate varying needs. Vertical space is important and mobile shelves are built with the intent to expand and adjust as your collection grows. They also offer more space usage per square foot, ensuring maximum retrieval efficiency for both staff and customers. High bay shelving is an essential element of document storage, especially when it comes to crucial archival material. No one in a records department can afford to snag or damage your precious paper and other archive materials via poorly designed shelving. Also, you’re always going to need extra space as your collections grow. We can design your storage and off-site spaces with specialized high bay shelving that guarantee the highest level of security and safety for valuable documents. Our shelving solutions can also be easily adjusted post-install to accommodate changing needs. If you operate a gallery or museum and are regularly transporting artwork or artifacts, you need to be sure that you have reliable containment so that everything stays in place. We’ll help source the right size and materials not only for art and artifact display but also for storage and transportation. All of our freestanding storage solutions are designed with the best build in mind and are strong enough to keep even large art pieces completely secure over long journeys. 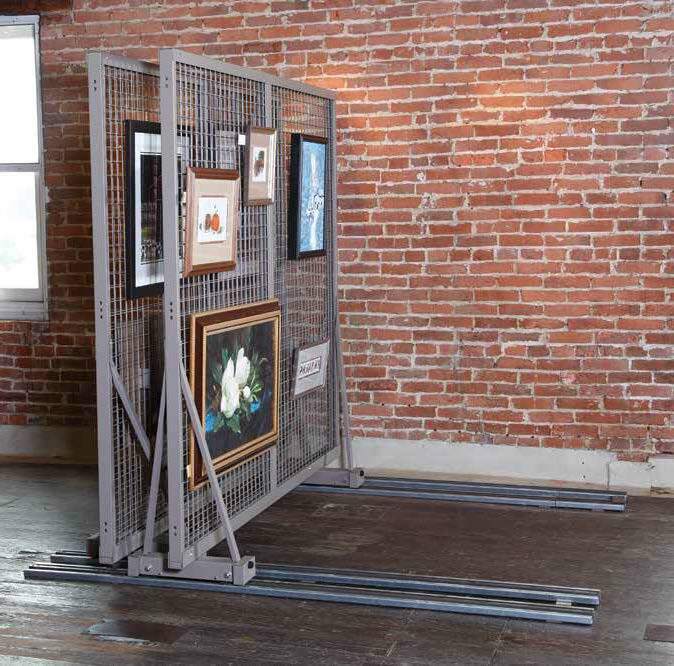 Our art storage systems have been specially designed to help libraries, museums, and other organizations to meet the unique challenges of moving and storing works of art. By using the art storage systems from BSC, you can hang up to three times more work in the same space, and the rotating system allows you to keep a close eye on your collection. Precious library, art and archival materials such as those found in museums can deteriorate due to temperature extremes, humidity fluctuations, light, pollutants, mold, and pests. Certain materials will be more sensitive to break down than others and some, such as paper, are particularly vulnerable to natural damage. External conditions such as extreme weather and humidity can destroy archival materials, and smoke damage can occur even from a distance. Human touch can also affect valuable items and documents because dirt and sweat from the hands can easily transfer to the material. Having the right media unit is a critical step in preventing damage to archival collections. For instance, when positioned and sized correctly, a well-designed library storage space will allow maximum accessibility and eliminate the potential for paper scrapes and tears. When it comes to the design and installation of library and museum storage, or any situation where you might need to preserve specialized art, artifacts, or documents over an extended period of time, you want to ensure that items are placed and structured in such a way that minimizes potential damage. We’ll help you with product information, floor layouts, and ensure you understand every step of the building or renovation process. Moreover, we’ll provide efficiency with the install process so that you can focus on what you do best with minimal interruption. Business Systems and Consultants Inc. is a leader in quality industrial storage, material handling, and modular office solutions. BSC is committed to providing our clients with the highest standards in innovation, safety, and quality, and serve in a range of industries from aerospace to law enforcement to healthcare and beyond. We’ve been offering outstanding service for over 40 years. Want to learn more about customized storage solutions for your organization? Contact us today for more information — we’ll be glad to hear from you!